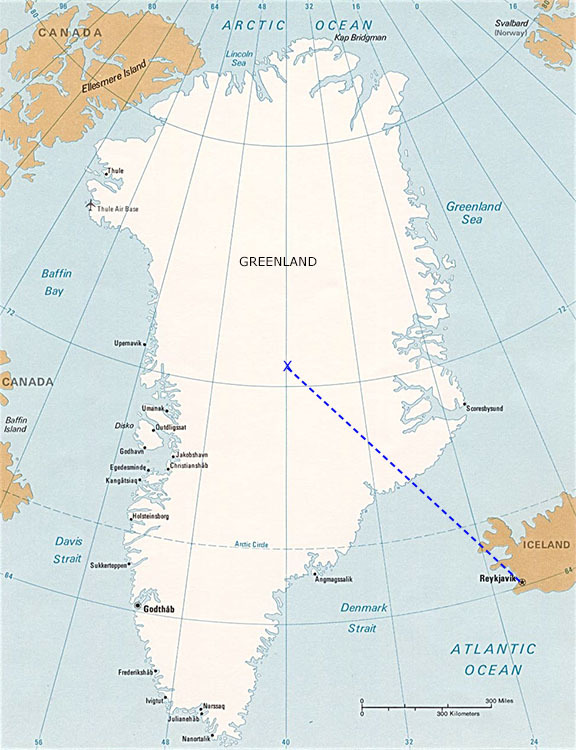 Dashed line shows approximate flight path to estimated position of expedition camp. During the years 1948 - 1953, the French government conducted several polar research expeditions to Greenland. Because ships could only deliver supplies to ports along the coast of Greenland, the French adopted a system for delivering supplies to inland camps by dropping them without parachutes from aircraft at altitudes as low as 20 to 30 feet above the ice-cap. Only 3&percnt; of the cargo was lost during such drops. In early June, 1951, one such flight was flown by a Seaboard DC-4 commanded by Capt. Joe Halsmer. They picked up the 10,500-pound load of food and gasoline in Reykjavik, Iceland and flew it to an expedition camp 900 miles from the North Pole. The crew pushed the cargo out during four passes at an altitude of 25 feet and then returned to Iceland. The round trip took eleven hours and navigation was extremely difficult due to a lack of useful compass readings, radio navigation aids, and landmarks.